Yum! 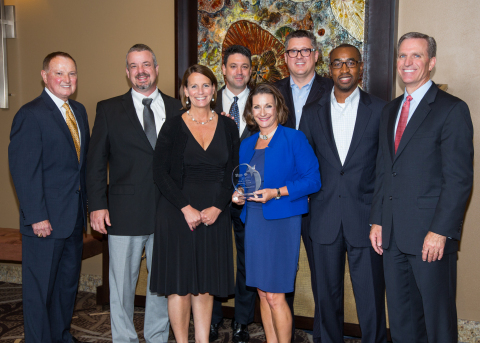 Brands, Inc. (NYSE:YUM) presented its inaugural Supplier Diversity Award to The BAMA Companies, Inc. (BAMA) at their annual supply chain awards. The Supplier Diversity Award was created to honor a supplier demonstrating significant leadership in the area of diversity and inclusion. For more than 20 years, BAMA, a woman-owned business enterprise, has been a leading and valued supplier of quality baked goods to KFC, Pizza Hut and Taco Bell. They have demonstrated a strong commitment to driving diversity and inclusion efforts in their organization. “We believe it’s critical to reflect the community’s diversity in all that we do, including our supply chain. I’m pleased to recognize BAMA with our first Supplier Diversity Award for their outstanding contributions to our business, and for demonstrating that diversity and inclusion is a business imperative,” said Greg Creed, Chief Executive Officer, Yum! Brands, Inc.
Holding Unconscious Bias training, hosted by James Fripp, Senior Director of Yum! Global Diversity & Inclusion, and facilitated by Howard J. Ross, author and thought leader on culture, leadership and innovation. The training helped attendees be better employees and colleagues by reflecting on what causes biases, acknowledging them and understanding how they impact decision-making. Offering a Minority Lending Program to diverse prospective franchisees, providing access to capital so they may enter the system if they are otherwise qualified. Fostering Employee Resource Groups (ERGs) in the areas of: International Professionals, LGBT Professionals, Multicultural Professionals, Women Professionals and Young Professionals. Additional ERGs will be created to meet the interests and needs of employees. Celebrating World Day for Cultural Diversity to raise awareness about the importance of inclusion, understand different cultures and recognize the uniqueness of people from different cultures, including Yum! employees globally. Visit http://www.yum.com/responsibility/diversity and http://www.yumcsr.com/people/diversity.asp for more detail on Yum!’s diversity and inclusion efforts. Yum! Brands, Inc., based in Louisville, Kentucky, has over 41,000 restaurants in more than 125 countries and territories. Yum! is ranked #216 on the Fortune 500 List with revenues of over $13 billion. In 2014 Yum! was named one of the Aon Hewitt Top Companies for Leaders in North America. The Company’s restaurant brands – KFC, Pizza Hut and Taco Bell – are the global leaders of the chicken, pizza and Mexican-style food categories. Outside the United States, the Yum! Brands system opens over five new restaurants per day on average, making it a leader in international retail development.